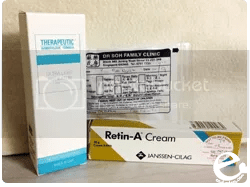 on the 2nd month of antibiotics and 2nd week on Retin-A cream as prescribed by Dr Soh. i’ve read many good reviews about the cream and people seeing results within 3 weeks or longest 3 months. keeping faith with it now and i’ve been religiously applying sunscreen everyday since it is a necessity with this drug. was initially given Nimegen but i later found out the soft caps contains gelatin obtained from Bovine so i’m glad i had it changed before i started consuming it. in March, i took up my waxist’s advice to use a range of MaryKay products. after two months, i didn’t see much improvements as she promised (in fact, it seemed to have gotten worse) and i started panicking. then i started searching forums and found this TCM clinic which had a couple of good reviews so i decided to try this out. oh, and i totally hate it when ppl around starts coming to me and say, “eat too heaty food huh?” or “are you very stressed?” and all. cos to me, it just sound like “omg, wtf happened to your face?!”. i know they meant well but still, it hurts to hear those every other day..
probably should have visited a GP or skin doctor sooner but i only managed to get to Dr Soh in July. although he said mine was not a serious case, it was pretty disheartening to hear his comments about the sides of my face being inflamed and there is a high possibility of scarring. well, at least i’m a little consoled that he said it should clear up in probably another 3 months or so. keeping my fingers (and toes too) crossed tightly for now!